Susan B. Anthony knows a thing or two. I have a new set of wheels. I fought the idea of getting it for many months because we are trying to embrace a more minimalistic existence and adding a second bike to my clutter didn’t strike me as a move towards reduction. But my job recently put me to work in an office park that is a soul-crushing 50-minute walk from the CBD. And though the ‘burbs of Brisbane are nothing like the suburbs of American cities, I still felt isolated by the limitations of foot travel and the banality of my suburban daytime existence. I missed the convenience of being downtown – walking to work with R, going to yoga at lunch, zumba classes, shopping, and having whatever else I wanted at my fingertips. The only answer to this dilemma was a new bike that could get me quickly and comfortably to all the things I needed: a cruiser. And I found it on the first trip. It was unsurprisingly in the West End, a part of town with great farmer’s markets, ethnic restaurants, trendy bike shops, and all the brunch places one could need. We came across a little shack with about 40 re-vamped bikes out front and I immediately knew I would need to go no further. 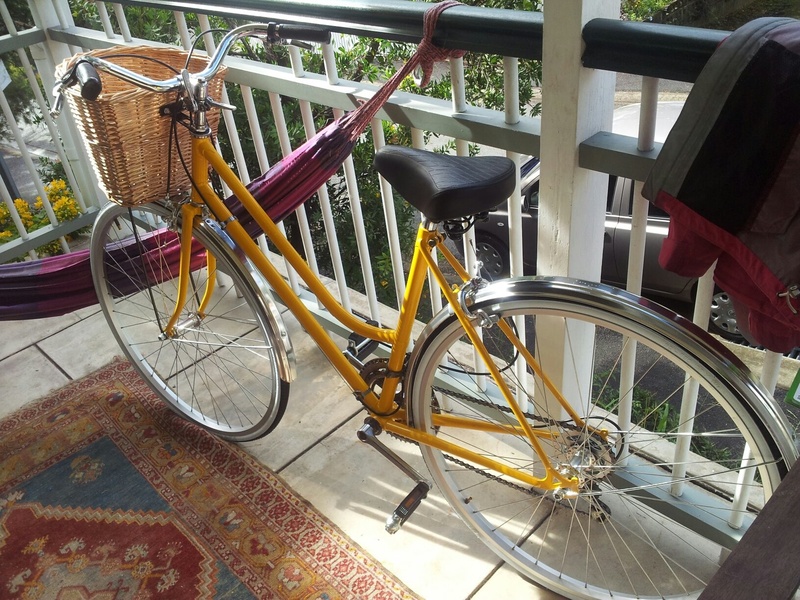 I tried two bikes out, but I really knew the whole time that I wanted the yellow cruiser, with white-walled tires and aluminium (yes, that’s al-you-min-ee-um!) splashguards. When they told me it came with a basket, I almost died. It’s adorable, indeed. But the most incredible part of my bike is the sense of freedom it gives me. Never before did the Susan B. Anthony quote above mean so much to me. I hadn’t realized how much my walking habit was restricting my exploration of the city. But when it takes more than 40 minutes to walk somewhere, that somewhere suddenly becomes less of a desirable place to go. With a bike I can see and do so much more in Brisbane than I previously could. I can bike to work, and then run errands after work all over town (without being that person dressed in all her cycling paraphernalia tapping loudly through the supermarket and attempting not to slip and fall). I can head to a restaurant for dinner, check out a shop, and grab drinks with friends in less than half the time it would have taken me to do while walking. What’s even better, is that this bike is so stylin’ and comfortable that I can ride to work in dresses and heels, coast into elevator, and walk to my office. No changing clothes and fussing with shoes. It’s nice to have such a functional and easy bike. I have to add, that this bike has been a pick-me-up for me lately. I have been feeling the distance pretty strongly recently. I am happy with my lifestyle here, but I miss so many people from home and sometimes I have to admit that it gets lonely being on the other side of the world from all of the people I care about. Now that R and I have booked our trips home for the summer, the anticipation seems to be building more quickly than before and I find myself having phantom sensations of things at home – like the scent of a pine forest, the feel of the comfy couch in my parent’s house, or the squeezability of my sisters. Sometimes with distance you’re forced to steel yourself from thinking about such things in order to function. Thus, once you let even the tiniest thought through, it threatens the whole of the dike with its force. That’s where I am now, plugging the hole and hoping the time passes quickly! I’m thankful for R, and for the wonderful life we are creating here. I am thankful for the myriad opportunities that have come my way. I’m thankful for the yellow bicycle that gives me free rein of the city. I’m thankful that in just a few days I’ll be seeing Atmosphere – in Australia! I’m thankful that next week will mark two years with R, a true measure of personal growth and a happy milestone. There are more wonderful things here than I could possibly enumerate, but it all still feels a little empty without friends and family to share it with.